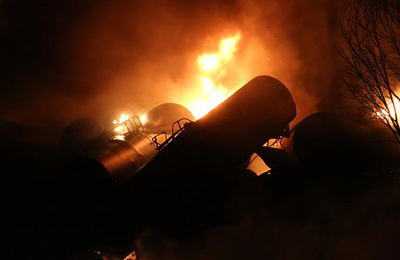 BNSF to increase safety precautions on its crude oil trains following recent fiery derailments in the US and Canada. BNSF has started taking additional safety measures for crude oil shipments because of four recent high-profile derailments in the U.S. and Canada, the railroad said Monday. Under the changes, BNSF is slowing down crude oil trains to 35 mph in cities with more than 100,000 people and increasing track inspections near waterways. The Fort Worth, Texas, based railroad also is stepping up efforts to find and repair defective wheels before they can cause derailments. BNSF spokesman Michael Trevino said these additional safety efforts were imposed last week in response to the recent derailments, including one involving a BNSF train earlier this month near Galena, Illinois, and the Mississippi River. “The recent incidents involving crude trains, including our own event in Galena, has led us to believe that we must take further action,” Trevino said. 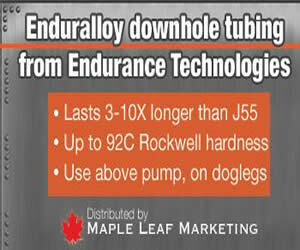 In February, a 100-car Canadian National Railway train hauling crude oil and petroleum distillates derailed in a remote part of Ontario, Canada. And less than two days later, a 109-car CSX oil train derailed and caught fire near Mount Carbon, West Virginia, leaking oilinto a Kanawha River tributary and burning a house to its foundation. 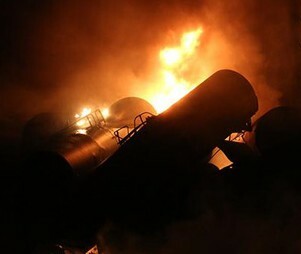 The worst of these crude oil derailments happened July 6, 2013, and involved a runaway train that killed 47 people in the town of Lac-Megantic, Quebec, just across the U.S.-Canada border from Maine. The number of rail accidents remains relatively small compared to total rail traffic, but fiery accidents involving crude oil are increasing because U.S. and Canadian oil production is booming. Railroads hauled 493,126 tank cars of crude oil last year, up from 407,761 in 2013 and just 9,500 cars in 2008 before boom took off in the Bakken region of North Dakota and Montana as well as in Canada. BNSF, which is owned by Omaha-based Berkshire Hathaway Inc., hauls much of the oil produced in the Bakken region. Trevino said the railroad had already doubled the frequency of track inspections near waterways; now it will inspect the track 2.5 times more often than regulations require. BNSF, like the other major freight railroads, uses a system of trackside detectors to identify wheels and axles that are beginning to fail. Trevino said the railroad will begin removing flawed wheels sooner to help prevent derailments. These new BNSF efforts go beyond the voluntary measures railroads agreed to last year when the industry pledged to slow crude oil trains to 40 mph in metropolitan areas and report route information to emergency responders. “The freight rail industry shares the public’s concern over recent high-profile incidents and we recognize, as part of a shared responsibility with shippers, more has to be done to further advance the safe movement of this product,” said Ed Greenberg, spokesman for the Association of American Railroads trade group. Federal regulators are finalizing new standards for the tank cars that carry crude oil and new rules for railroad operations that are expected to be released later this spring.